Tony Crafer, Contract Manager for Places Leisure, said: "We’re looking forward to welcoming everyone to the Dover District Leisure Centre. It’s a fantastic new centre and offers a real step change in the level of facilities and access. Whether you’re looking to up your physical fitness, or just have some fun with friends, there really is something for everyone." 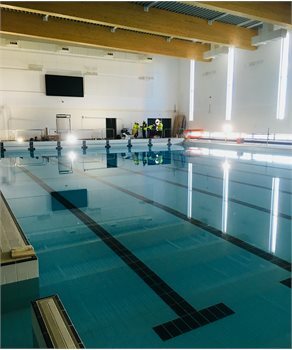 Cllr Trevor Bartlett, Dover District Council’s Cabinet Member for Corporate Property, said: "We’re delighted to be opening the new Dover District Leisure Centre on time and on budget. It’s been a real team effort and we’d like to thank Sport England for their unstinting support of the project, along with the many local people, sports clubs and teams, and community groups, who contributed their ideas and helped shape the new leisure centre."